Welcome to the Homeschooling Preschool series! 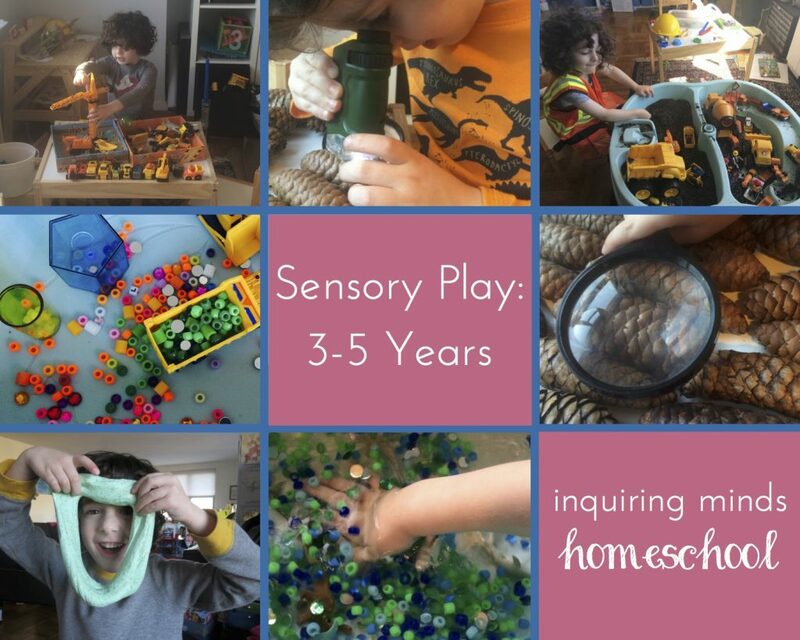 This post will talk about sensory play – how to get started, what to do if your kid hates sensory input, how not to get your whole house messy. Stay tuned for our other posts about early reading, math, science, social studies, music, foreign language, and art! Sensory play is simply how young children explore the world! From birth, infants respond to physical touch. They enjoy grabbing objects, feeling textures, and experimenting to see what will happen when they perform actions on things in the world. Proprioception, which is awareness of your body. We all know that clumsy person who crashes into furniture or hugs others too tight without realizing. That person isn’t deliberately rude – he or she might have poor body awareness. Balance. This isn’t just for gymnasts and tightrope walkers. Kids with poor balance might fall out of their chairs, slump at a desk or table, or feel dizzy or tired after trying to read for too long. During my classroom teaching years, I worked with many bright, curious children whose learning was affected by poor balance and proprioception. They greatly benefited from Occupational Therapy (OT). Their therapists collaborated with me in offering sensory activities tailored to their needs in the classroom. It was sometimes difficult to implement the suggestions fully in a structured classroom setting with so many competing needs and so little space! 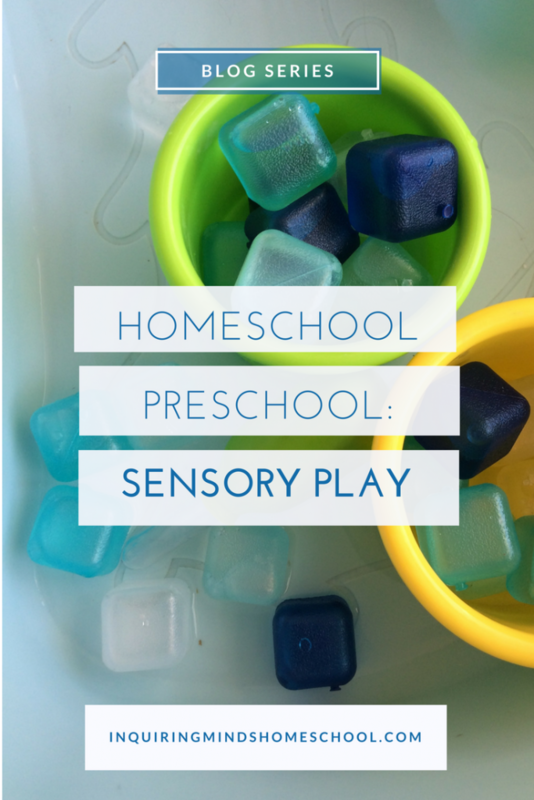 Incorporating sensory activities at home doesn’t have to be nearly so challenging! As human beings, we are wired to explore the world through all of our senses, immersing ourselves in a rich environment of sights, sounds, smells, tastes, and touches. If you’ve ever tried to stop a young child from touching something she shouldn’t, you know that kids are driven to explore with their hands! It’s biology. And it’s foolish to try to convince young children to sit and listen when what they need is full body immersion. 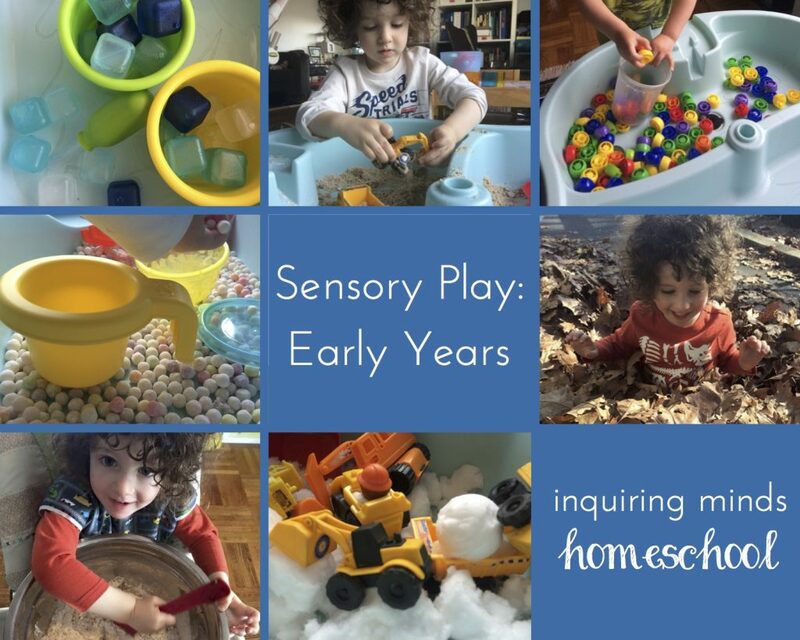 Well past the preschool years, multi-sensory experiences are powerful ways to learn content and skills. (We’ll discuss multi-sensory reading instruction specifically in another post.) When children can engage their full bodies in learning, amazing things happen! Outdoors – If you have a yard, driveway, or other outdoor area available, use it! You can get a sensory table or wading pool to fill, or set up on the grass or blacktop! You can even repurpose a portable bathtub. Plastic bin on a level surface – When my son was young, he had a great time playing with sensory materials while sitting in his high chair! Once he got old enough to sit at a little table, we started giving him materials in a bin that sat right on the table top. We also gave him the option of putting it on the floor if it was easier to reach. We put a waterproof mat underneath the bin to catch any spillage. Bathtub – Some parents prefer to let their kids explore messy materials in the bathtub! This post from Growing a Jeweled Rose has many suggestions for fun things your kid can do in the bathtub. Sensory table in the playr0om – This is the one we ended up using most often. We recently gave our table away to my niece after many years of enjoyment. You’ll see our blue Step2 table featured in MANY of the photos on this post! Sensory bags – Here is a link explaining how to create sensory bags easily and inexpensively. This is great for the younger set, but is also way less messy. If your kid hates getting goopy or sticky stuff on his hands, this is a good way to get him accustomed gently. Sensory bottles – Older kids might enjoy them as a “calm down” activity, while younger ones might just like playing with them. A note on sensory tables: If you decide to get a sensory table, I recommend finding one that has a reliable drain. You want to be able to just open up the drain and empty the table contents into a bucket. You don’t want a table that will leak all over your floor, or one that has no drain at all. The table we used had two sides, only one of which had a drain. This is the Splash n Scoop Bay, which is the model we had. There are MANY other sensory tables that would be just fine. So you’ve got your bin, sensory table, bathtub, or other play space ready. What are you going to put in it? There are nearly endless possibilities, but let’s start with the basics. You want interesting textures for your child to explore, and some simple tools to aid with the exploration. You can get a lot of mileage out of common items from your kitchen and bathroom, as well as toys and manipulatives that you may already have in the house. Young children are fascinated by the everyday colors, shapes, and textures that we take for granted! With young children, we do have to worry about choking and ingesting hazards. So, just like with regular playtime, sensory play should include only items that are either too large to be eaten or items that are clearly edible. There will be plenty of opportunity for fancy water beads and shaving cream later – spare yourself the hassle of worrying about your child accidentally putting something in his mouth, and try one of the ideas below. Water! Kids of all ages love water play. Simply splashing and pouring can give hours of enjoyment. You can augment your child’s experience with brushes, buckets, droppers, and other toys, or grab a few non-breakable cups and measuring spoons from the kitchen. Edible paint – Although painting is technically an “art” activity, most young children engage in it as a sensory experience first and foremost. Many kids don’t care about the finished product at all – they just love the feeling of goopy finger paint and smooth gliding across a paper or canvas. Until my son was turning 3, I didn’t use the “non-toxic” paint marketed for kids. Instead, we used natural ingredients. Check out my bookmarked recipes, many of which are safe for even young babies, here. Edible play doh – Making play doh was one of my favorite things to do with my early childhood classes. Not only was it easy, it used everyday stuff from the kitchen that wouldn’t hurt kids if they ingested it. Check out my Pinterest board for many recipes. Many just have 2 ingredients! There’s even a few especially for kids with sensitive skin. Edible water beads – The traditional water beads that kids love aren’t the greatest for the younger set. We used boba pearls (the kind you put in bubble tea) for a similar effect. Then we discovered that my son preferred to play with them dry! We bought just one pack and it lasted a very long time. Ice cubes – Make them small, so if your child eats one, it will quickly melt. Or, fill up a water balloon and pop it in the freezer! When you take it out, simply remove the outer balloon, and you will have a HUGE ball of ice for your child to play with! For extra interest, try adding food coloring to the water before you freeze it. Lids and caps from baby food – These can be great fun! We collected tons of these while my son was a baby, and found they made great manipulatives. Double check that the items don’t have sharp edges and aren’t a choking hazard before letting a young one play with them. Outdoor sensory play – Whether it’s making balls of mud, stomping in leaves, or rolling around in the grass, outdoor time is immersive sensory play that should not be missed! But what if it’s rainy or you don’t have an outdoor space handy? You can bring the outside in! We frequently filled our sensory table with snow, dirt, leaves, twigs, acorns, seed pods, dandelions, and other items gathered from outside. Any of the items listed for babies and toddlers. Just because kids get older doesn’t mean they outgrow sensory fun! Beads – I had beads left over from craft projects from my teaching days, but there’s a huge variety available at craft stores and online these days. My personal favorites are the beads that turn colors in UV light! Buttons – Whatever you have around the house, or get a cheap assortment! Rhinestones and other small shiny items – One of my son’s favorite games was to have “jewels” hidden under sand, or folded into Model Magic to be found and collected. Small kitchen ingredients: beans, rice, or pasta all work great. Some families prefer not to use food items, as this could be seen as a “waste”. However, I like these items because they are biodegradable, whereas plastic isn’t. Sponges (whole or cut up) – Add water & watch them soak it up, float them like boats, even add grass seed and grow your own floating gardens! Water beads – It’s not hard to see why these are popular. My son loves them! Soil – You can add water to make it muddy, or keep it as is. We’ve done a lot of planting over the years in our table! Slime – As a science teacher running a chemistry club, I grew to hate slime. But the fact is, kids love it! There are recipes that use all sorts of fancy ingredients, like contact solution (which is really just dissolved Borax) but one of my favorites is just glue, water, and liquid starch. This is potentially a deep rabbit hole, as there are endless variations on slime, but a great way to teach the scientific method. Baking soda and vinegar – Yes, this is the good old volcano experiment, but there’s no reason that you have to even mention the volcano. Kids just enjoy using droppers to make little fizzy eruptions on a tray or in a bowl. You can add food coloring for extra interest! Want even more ideas? This post has an extensive list of materials that you can put in a sensory bin! While using hands and fingers is great (and sort of the point of sensory play), many kids like to incorporate simple tools. This is awesome fine motor practice in addition to adding some challenge to the sensory table! Kids’ Tweezers – These are big and colorful, perfect for little hands. Scoopers – I like these because they’re held like scissors, but are much easier to use. Droppers – These make great bath and pool toys, and are essential for beginning science! Durable magnifying glass – I had sets of these in my science classroom during my teaching days. Even with the exuberant use by many kids, they held up well! Simple handheld microscope – This is a durable, but powerful tool that my 4 year old learned to use in about 2 minutes. He loves to look at specimens we collect (like the seeds, beans, and rice that would go into a sensory bin) but he also discovered that our carpets, bare floors, and clothing were fascinating! Switch to a texture or activity that your child prefers. Try the challenging activity again as your child seems ready for it. Offer gloves. This is a way to get kids started with the activity. They might get irritated with the gloves and pull them off, then get their hands in there. But if not, they’ve still made a start engaging with the material! Use a sensory bottle or bag, instead of having your child touch the materials directly. Offer tools such as scoops, droppers, and shovels. Include a child’s preferred toys in the activity. For my son it was construction vehicles that made most sensory activities worthwhile. Don’t use anything that is hard to clean. If your child is consistently sensory averse to the point where it is interfering with everyday activities, consider talking to your pediatrician. 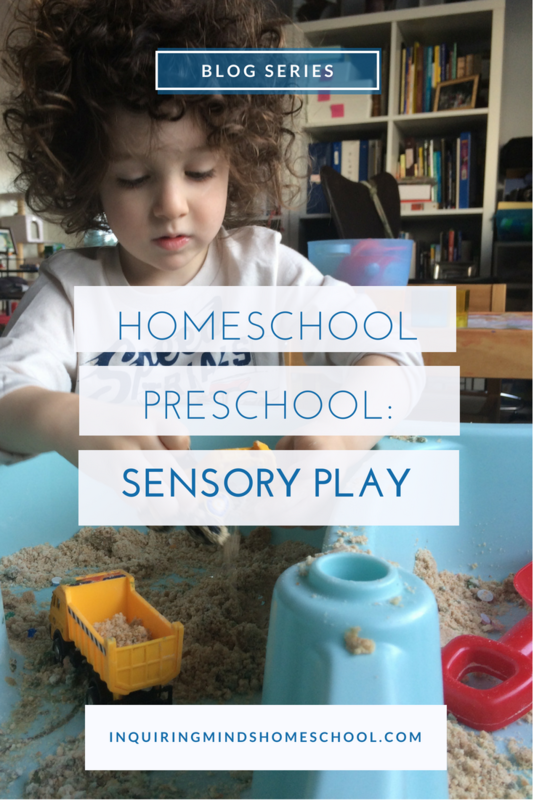 Sensory play is developmentally appropriate FUN for your kids! And although this post is about 0-5 year olds, as someone who has taught middle school, I see no evidence that kids outgrow it! Even adults love it (raising hand here)! What do you think you’ll try first? Leave a comment below!